It seems Valve has placed new restrictions concerning gifted Steam games which forbid the games to be played outside the country they were bought on. 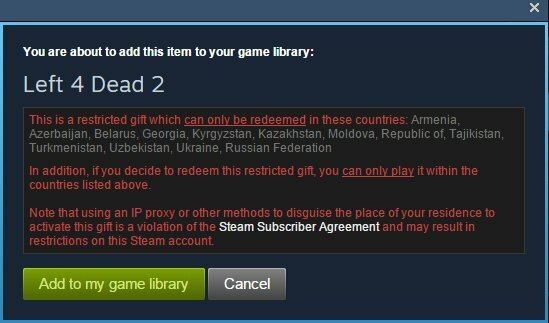 According to a rather lengthy Reddit discussion, this restriction is active since December 2014, when Valve placed limits to gifts between different regions. There was a trend on Steam the past few years, whereas users were taking advantage of lower game pricing in some countries (like Russia, for instance), so they bought games there for cheap, and then gifted them to other accounts in other regions like the US or Western Europe, where the games were more expensive. We are certain some shady CD key selling sites were practising the exact same method. In any case, this trend seems to be coming to an end, since now Valve decided to do something about this and now restricts not only the place where you can buy your games, but where you can play them as well. Unfortunately, this new policy has an impact on several legitimate users. A Reddit user from Ukraine mentioned for instance that he was forced to buy Skyrim a second time when he moved to the US, because his Ukrainian copy would not play at all. He actually got help from Steam support, because at first he couldn’t even buy a new copy, since Skyrim was already present in his Steam account (albeit non-functional). Of course Steam support tells you that if you are one of those that are affected, you are completely out of luck, since “Steam Support is unable to modify or remove any region restrictions.” This means that if you want to move to another country, or just visit one for vacations and you have a big library of games, you could be severely affected by this. Hopefully Valve will address these concerns in the near future. So beware of where you get your games from and where you intend to play them.